Today, I'm proud to present an interview with Jim Bernheimer, author of the smash hit superhero novel Confessions of a D-List Supervillain (which I reviewed here.) Jim has just published a prequel to that novel called Origins of a D-List Supervillain. which brings back Cal Stringel, the vengeful engineer from Confessions and shows us how he got his start as a supervillain. Shelley: I’m always impressed with the wit and charm of your writing. At times, it reminds me of Robert Asprin or Keith Laumer. Yet, the only modern writer you list on your website as an influence is CT Westcott. What authors influenced your style? Bernheimer: I enjoy wit in my novels. One of the novels I always think about when it comes to that is Peter David’s Howling Mad. The premise is what happens to a wolf bitten by a werewolf. Stories like that which take something familiar and give it a new twist. The late Aaron Allston, who I was fortunate to meet had a very inventive novel called Galatea in 3D that had a real, “Wouldn’t it be cool if?” story behind it. Shelley: Superhero novels have not always fared well in the publishing industry. In the 80’s George RR Martin’s Wild Cards series did pretty well, but by and large other authors ignored the genre. It wasn’t until the past few years with the Indy publishing boom that they really seemed to take off. What made you decide to write a superhero novel? Bernheimer: I was looking for something that wasn’t being overdone and I’ve always like superheroes. A modified novella version of Confessions of a D-List Supervillain (basically the first five chapters with an alternate ending) appeared in the short story collection where I was testing the waters of what direction I’d like to go. The novella got all the reviews and so I decided to expand it into a larger piece, which is why I get so many, “It seems like two separate stories” reviews. Shelley: Why did you chose to write from the point of view of a Super-villain? Bernheimer: Villains are more fun. Plus, I wanted to do the anti-hero. With a hero like Spiderman, you always have the struggle to do what is right. An anti-hero can fight their inner demons or invite them out to play. Shelley: Confessions has an amazing Amazon rating (177 5 stars, 79 4 stars, 4 3 stars and only 1 2 and 1 star ratings!) That’s not only a testament to your skills as a writer but it also suggests your novel connected with readers. At this point, it appears to be your most popular book (at least on Amazon). Did the success of this novel surprise you? Bernheimer: I knew it was a good story. Timing was on my side because superhero movies were becoming hot. So, the success was more enjoyable than surprising. I could say that sales numbers don’t matter to me or some other type of altruistic rubbish, but my obsessively tracking them kind of flies in the face of that. What is surprising is when I’m looking at the reviews of other novels in the genre and the reviewer references my story. That’s humbling and encouraging when people like my writings enough to discuss it. Shelley: One of the things I enjoyed about Confessions of a D-List Supervillain, the first published book in this series, was the number of interesting heroes (Ultraweapon, Aphrodite, The Biloxi Bugler, ect...) you introduced. It was good to see The Biloxi Bugler show up again in Origins. Might we one day see a novel told from the viewpoint of one of your Superheroes? Bernheimer: Probably. I have Cal’s story plotted out, but there is room for expansion. Shelley: I started with Confessions but now that Origins of a D-List Supervillain (the prequel), what book would be best for new readers to begin with? Bernheimer: It doesn’t really matter to me. Most of the reviewers are recommending that people new to the universe start with Origins now. Shelley: Did you read comic books when you were growing up? If so, did you have a favorite comic or superhero? Bernheimer: Yes. I stopped collecting in the early 90’s. Sad that seems like a long time ago now. I was more of a Marvel guy as opposed to DC. I read a lot of Xmen, but for some reason I always had a soft spot for Alpha Flight. Shelley: If Hollywood called you up tomorrow and said they wanted to make a movie out of Origins of a D-list Supervillain, who would you want to play Mechani-Cal? Bernheimer: I used Randall from Clerks as a mental model for Cal when I was writing the story – so Jeff Anderson. Shelley: You write very convincing Engineering details in your book. Do you have an Engineering background? Bernheimer: I was nuclear power plant technician during my stint in the Navy. After I got out, I went into computers after a stint as a Radcon tech. I would never claim to be an Engineer, since usually that requires a degree in that field and professional licensing, but I do have a technical background and try to make my science at least somewhat grounded in reality. Shelley: With Origins completed, what are you working on now? Bernheimer: I’m clearing my plate so I can start the next D-List books. I have a finish listening to the audiobook of Spirals of Destiny Book 2, the audiobook for Origins is in production and should be done in July, there is a short story written in the D-List universe about the Semi-Transparent man (In Origins, Cal mentions him briefly during his prison stint). It’s a stretch goal in an anthology, but it might not make it in. I will probably try to write the 3rd and 4th books in the D-List universe and release them together. As I started laying out the 3rd book, I figured that I’d have Stacy wanting to know the details behind Cal’s sleight of hand. The problem was as I was doing this, I realized there was enough for a “Companion” piece to Confessions that covers Cal’s time with the Gulf Coast Guardians in more detail and the time period between the last chapter of the book and the two epilogues contained in Confessions. So, the third book has the working title of Secrets of a D-List Supervillain (or perhaps Omissions of a D-List Supervillain) and the fourth book will be either Rise of a D-List Supervillain (or Trials of a D-List Supervillain). Guess I’d better get writing. Shelley: Thank you for participating in this interview! Bernheimer: Thanks for having me! The creator of the site put in a lot of time and effort developing this cool homage to a show I wish really existed. Especially in the details of the episode guide. 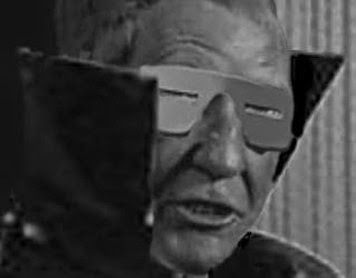 Check out Burgess Meredith as the Mole Man. He would have been perfect for the role. 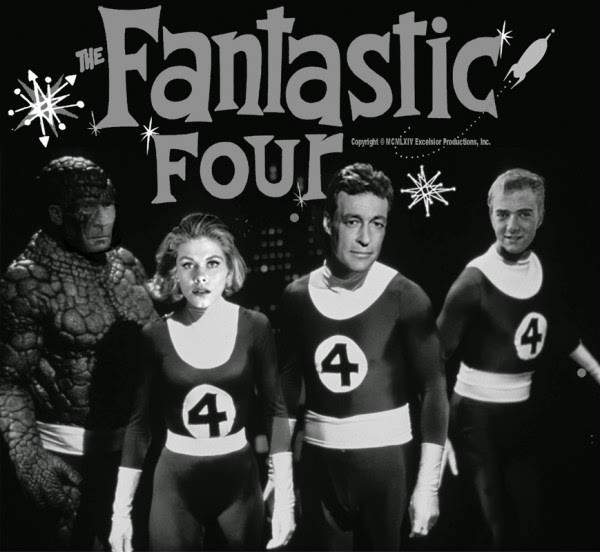 The FF Series site reminds me of Trey Causey's realistic take on the Fantastic Four mythology on the FBU several years ago. I hope we see more of this type of stuff in the future. Who else would be fair game? Spider-man? Avengers? 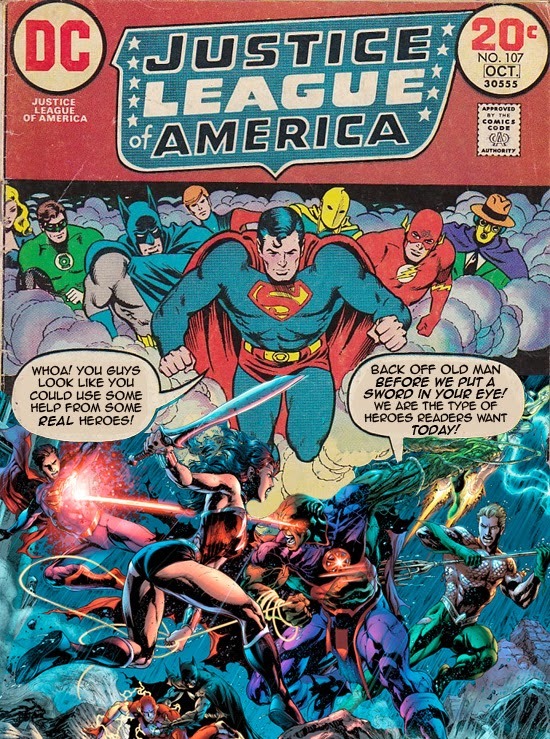 Silver Age Justice League? This weekend I went to HeroesCon in Charlotte, NC. I have skipped the last several years but this year I made the trip so I could meet Ramona Fradon, artist from the Silver Age Aquaman and Metamorpho. This was her first visit to HeroesCon and she said she was very impressed by all the people who had come up to say hello to her and tell her how much they enjoyed her work. She said one guy said her Aquaman comics inspired him to become a Marine Biologist and another fan said Metamorpho inspired him to become a Chemical Engineer. 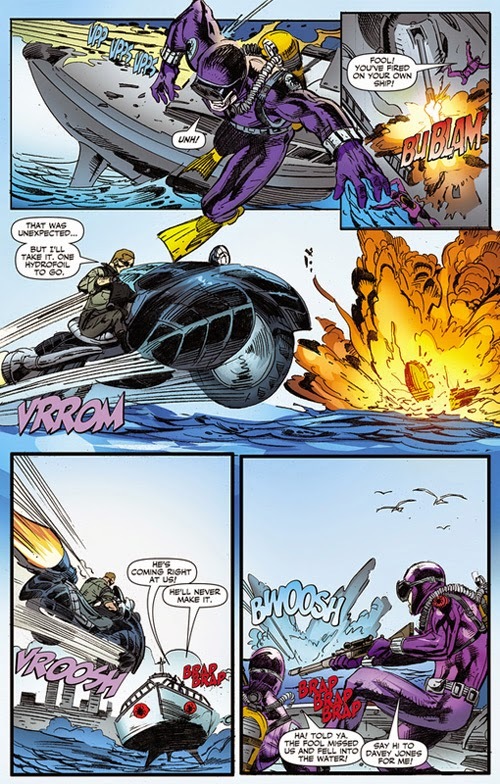 As I've mentioned in the past, a Ramona Fradon Aquaman collection was my very first comic and I've enjoyed her art ever since. As always he entertained us with stories about Europe, Comics and fans he as met over the years while he drew a sketch for Haigen. Overall the con was very well attended, with a much larger cosplayer turnout than I had ever seen before. The con photographer (who was taking this group Cosplay picture) told me that the cosplay turn out was 3 times what it had been last year. I wasn't sure how my daughter would like the con. She's gone to smaller local cons here in Columbia, but nothing near the size of HeroesCon. As it turned out, she had a great time at the con and is already planning her own cosplay costume for next year. The Return of the Pre-New 52 DC Universe? Regular commenter GACN alerted me to the news that DC may be bringing back some of the pre-New 52 Universe characters. There still seems to be confusion among editorial, and thus, creators, as to what the title and plot actually are, and it has changed several times. 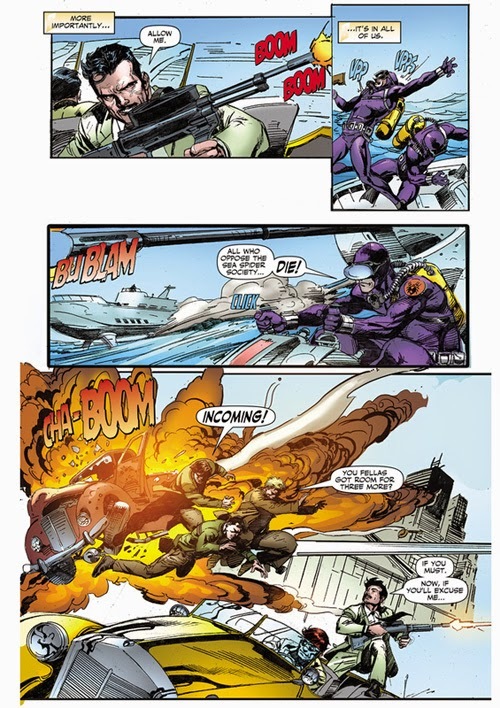 The current plot might be comparable to Marvel’s Contest of Champions/Secret Wars from back in the day. As of now, it is intended to be in-continuity and not an Elseworlds-type story. It will feature some pre-52 characters along with New52 characters. So, apparently, the old pre-52 universe still exists somewhere, although how this is possible without invalidating Flashpoint is not clear. What do you think? Are you looking forward to this story? Might it open the door to more stories from the pre-New 52 Universe? Would you like DC to just reboot back to the Pre-New 52 Universe altogether? 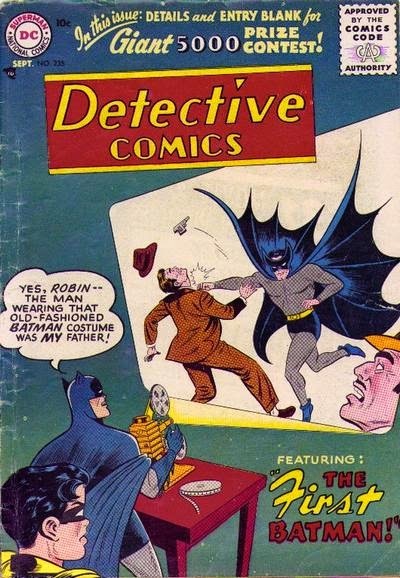 I originally thought that was the only appearance of that costume, but while googling for references for this cover, I found it showed up other places. 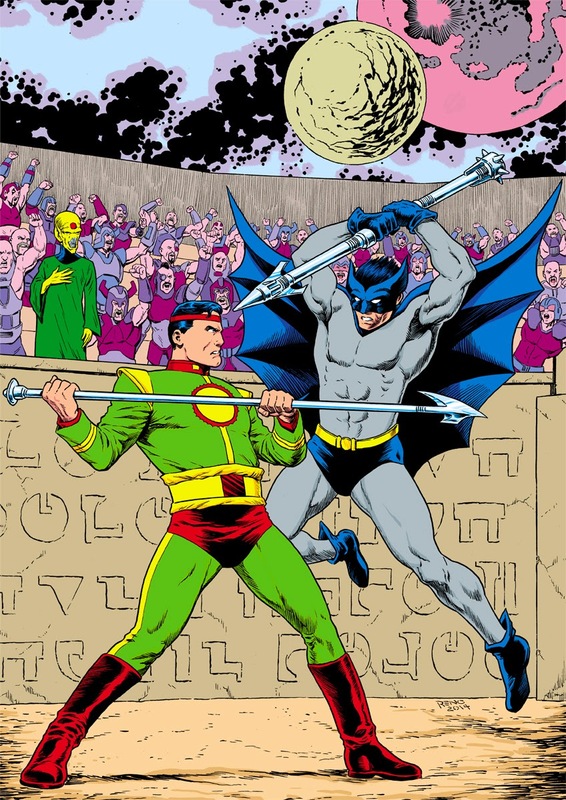 Here it was in Untold Legends of the Batman 1 drawn by John Byrne. As to World of Krypton, that's a post for another day. I recently discovered that an upcoming Marvel event is something called Axis which will involve the Avengers and X-men fighting against an alliance of several Marvel supervillains. So, yeah, as events go, this latest one definitely seems like it's running on fumes. Morbid Mysteries - this is an event storyline that revolves around the unsolved murder of a some character. I actually like this type of storyline simply because so often, mysteries in comics are simply "Who is this mystery character?!" rather than a true mystery. When you consider how popular mysteries are on prime time television, their absence from superhero storylines is a bit surprising. Toyetic Teamups - this is an event where some gimmicky grouping of characters is the hook. Looking at these, you can sort of see how an overdose of the Continuity Conversions has led to those getting devalued over time. One too many such events have suggested the storyline was going to change everything we ever knew only to leave us with nothing more than, I don't know...a momentarily dead Hercules. Looking ahead, I suspect Grant Morrison's upcoming Multiversity storyline will be a bit Toyetic, but I'm going to check it out. He's usually got a good ear for what to keep and what to ditch when he's pulling items out of his fanboy closet. While I find such wild abandon amusing, I suspect most Marvel fans want something a bit more conservative in nature. It should be interesting to see how that pans out. 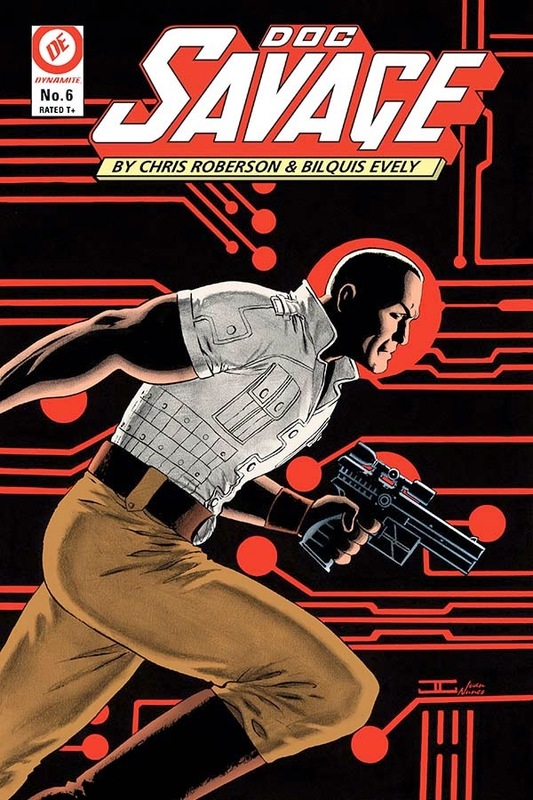 This month, Bleeding Cool has an interview the Chris Roberson about his latest issue of Doc Savage, wherein there is no mention of him ending his run on the title which was previously reported in another interview with Roberson last month. I picked up the first issue of this run and wasn't that impressed with it. I consider myself a casual fan of the character having read several of the books as a kid and a couple of the newer ones by Will Murray recently. That's the initial scene you see when opening the comic. Scuba Gear, Hydrofoils, Jet Skis...It's doesn't do much to set the 1930's tone does it? 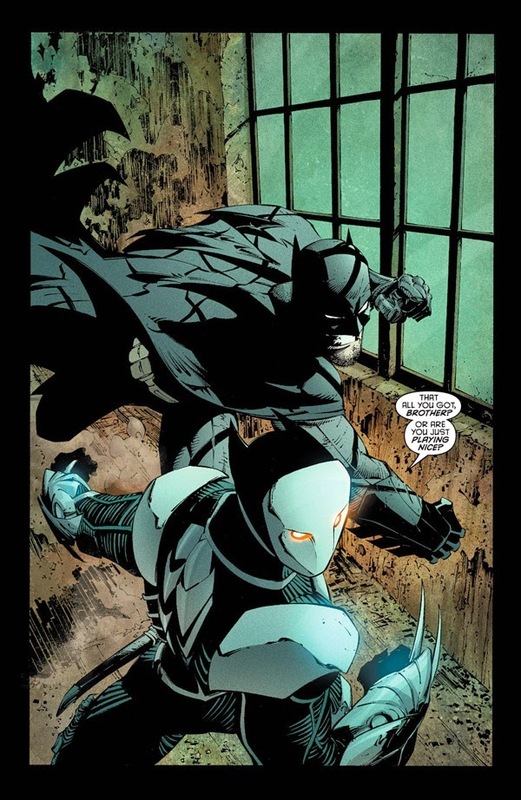 The art here could just as easily been from a Nightwing comic. I don't know. Maybe I'm being too nit picky on this. Did anyone else try this series an like it? DC recently announced the official title of the Man of Steel sequel. Turns out, it’s not a Man of Steel sequel at all. My fellow podcast brothers and I recently poked fun at this on a weekly SNL Weekend update style Nerdy News show we do. This is what we came up with. It almost guarantees we will see a variation of the fight from the end of Frank Miller’s Dark Knight Returns. I was desperately hoping that we would avoid this. Specifically this scene. It looks like that won’t be the case. I’m one of the biggest Superman fanboys I know. When I collide with a similarly scaled Batman fanboy, the age old Batman Vs Superman almost inevitably comes up. Honestly, I’m almost sick to death of the argument, but Warner Bros. knows it’s what the mainstream wants and, by god, they are going to get it! 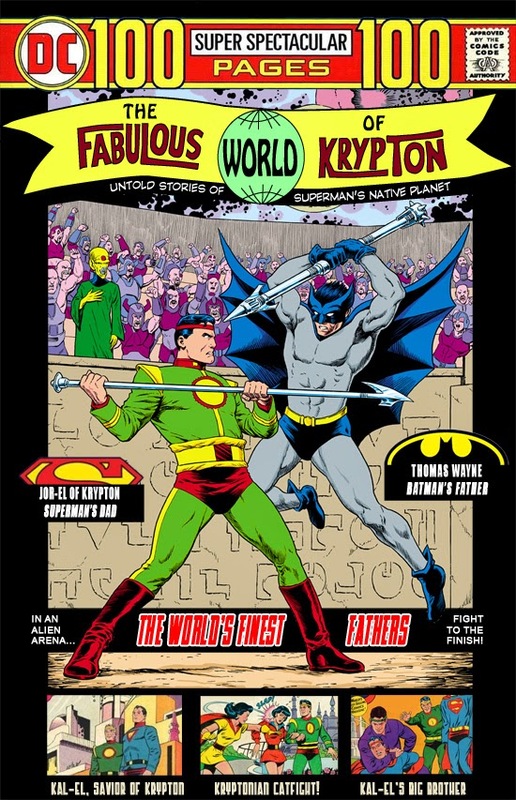 I would much rather have had this movie be titled World’s Finest, and not have it include this drag down fight everyone wants to see. 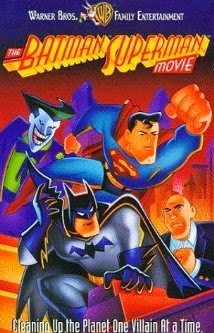 I really enjoyed the Superman Animated Series version which encompassed three episodes titled World’s Finest. Superman and Batman didn’t fight, but also didn’t like each at other at first. 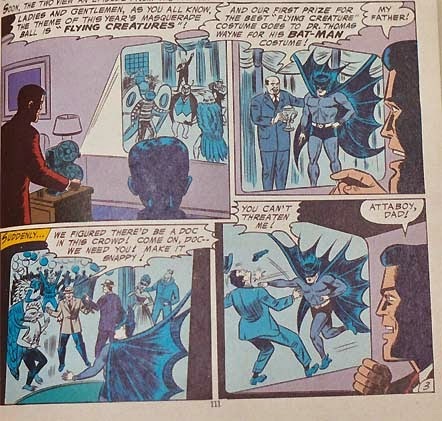 Batman, simply, showed Superman that he could do everything that a man with superpowers from outer space could do just in a different fashion. It concluded with the two realizing that they could do much greater good together than apart. THAT is what I would like to see. 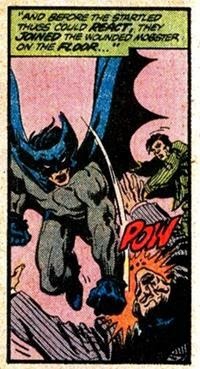 Unfortunately, people want to see the drag down fight and watch Batman win because “HE’S BATMAN”! I have a strong suspicion that is what will get, and I will have to keep reminding people that even though he won here, Superman, at anytime he wanted, could simply lobotomize Batman from Space. "They’re obviously beginning something, and there’s a stretch of these flicks. This is the beginning of the Justice League, as we all suspected as they were announcing that cast. We were like, ‘This is the beginning of a Justice League movie.’ From what I understand now, it’s no longer like, ‘This is Superman 2.’ They’re not doing these things. They’re doing like, ‘Here’s Man of Steel. Here’s Batman/Superman: Dawn of Justice.’ The next one is not like a sequel to one of the characters. They’re just going to keep building their universe for about five or six movies. But all of them…it’s supposed to tell one massive story, which is all Justice League oriented." I am 100 percent for this, and I think it’s a good way for DC to “catchup”. Having these movies to focus on one of the Justice league members but include the others, is a good jump ahead and can end up really good if written well. I know that I was watching Iron Man 3 thinking, “Where is Captain America while the AMERICAN President is being abducted?” I know that’s a small nitpick but it would be fun to see that sort of thing and it seems DC may be going that route. How Awesome would it be, if these actors played the evil versions of themselves, and actually fought them?! Maybe it’s just wishful thinking, but I feel with some good build up that could turn out great! This would also mean the inclusion of the DC multiverse, in some fashion, which is kind of scary, but it can be done! That’s my dream. What would you like to see in an ongoing series of Justice League Movies?